Description - Durable yet highly shock absorbent, our 15mm Impact Designer Series tiles are hands down the best flooring option for any multi-purpose gym. Designed with high impact workouts in mind, these interlocking tiles feature a 3mm standard rubber top, allowing you to use this product in areas where weights and other gym equipment are present. Easy to install and maintain, these colorful rubber tiles are available in center cut tiles and are backed by a 5 year warranty. Since each tile features a 1/2” layer of rubber underlay, each tile is not only very slip resistant but will also provide you with optimal sound absorption. 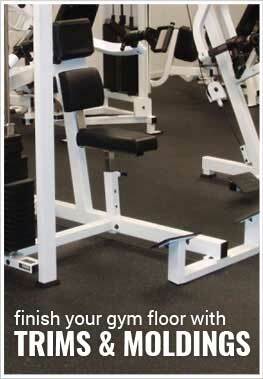 This makes this tile great for upstairs gyms, playrooms, bedrooms and much more. Material – Recycled SBR rubber and colored EPDM virgin rubber flecks. Weight – Each rubber tile weighs approximately 9 Lbs. Recommended Uses – 15mm Impact Designer Series tiles are the perfect flooring option for any high impact workout and have been successfully used in commercial gyms, home gyms, as playroom flooring, as flooring for Cross Fit, in basements, as flooring for trade shows, in upstairs gyms, bedrooms, and playrooms, and any where a durable yet shock absorbent floor is desired. 12mm Impact Rubber topped with 3mm Standard Rubber. Great for both Residential and Commercial spaces. Slip resistant and shock absorbent. Backed by 5 year warranty. We just received the 15mm rubber flooring. 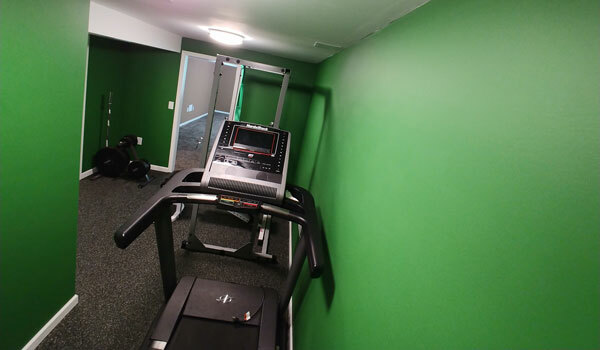 This is going in an exercise room which has a concrete slab that is 20 years old. Do you suggest a barrier? Or do we place the tiles directly on the concrete? Our 15mm Impact Tiles - Designer Series can be placed over the concrete no matter the age. If the concrete is clean and fairly flat, you should have no issues. If you do have a moisture issue, it may be pertinent to place a vapor barrier between the flooring and the concrete. This will help to eliminate the growth of mold and mildew underneath the tile and prevent sweating. If there is no moisture issue, then a vapor barrier is not needed. Concerned about the odor as these are made from rubber, is there any? Our 15mm Impact Tiles - Designer Series will have a slight odor to them. If you are sensitive to the odor, we recommend mopping the floor with a mild soap and water solution and then letting the flooring air dry. You may have to repeat this process a few times to really dissipate the smell. The smell is not toxic, so don't fret; It's just a foreign smell similar to that of new clothes or shoes. The 15mm Impact Tiles - Designer Series are high quality and were easy to install for my home gym. Easy to clean and have a good under foot feel. There is a rubber smell with the tiles which is to be expected but clears out with open doors. Would definitely buy again. 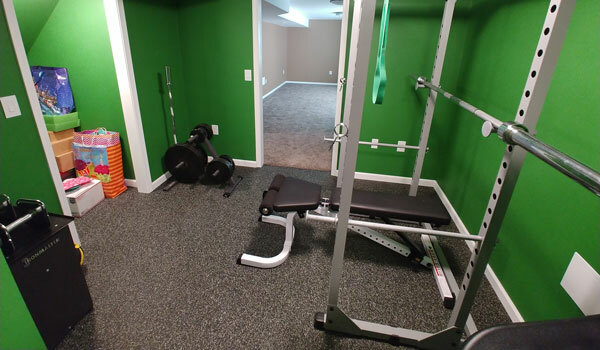 I bought these tiles for the floor of my home gym in the basement. The color, blue is great. The tiles have some "give" in them. They are nice to walk on. However, the seams show, probably because my basement floor is uneven. I would buy them again. In fact I'm thinking of extending them into the adjoining laundry room. I used these tiles in my 2000 sqft home gym. These feel amazing! I was going to go with the 8mm Strong Tiles - Designer Series but after talking with the sales rep I went with these. I could not be happier. The big difference is that these tiles have a more give then the "Strong tiles", it feels much better for my P90x work outs. I highly recommend these if you want an AMAZING look with a professional gym feel.